Keratoconus is a progressive eye disease that occurs when the normally round cornea becomes thin and bulges into a cone-like shape. The irregular shape deflects light as it enters the eye, preventing the light from being able to focus correctly on the retina, ultimately causing distorted vision. 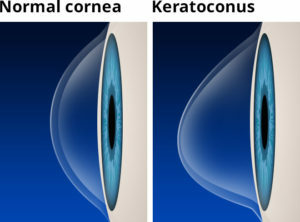 Depending on the severity, keratoconus treatment can vary. The specific cause of keratoconus is unknown. Keratoconus can be associated with a history of poorly fitted contact lenses, overexpose to ultraviolet rays, and chronic eye irritation. New research suggests that an imbalance of enzymes within the cornea may be what is causing the weakening of the corneal tissue, which leads to keratoconus. Laserfit scleral lenses have been proven to successfully treat keratoconus symptoms. For many of our patients with advanced keratoconus, Laserfit greatly reduced or eliminated the glare and ghosting they had struggled with from traditional lenses. To find out more, view our patient stories, FAQs, or contact us and learn how Laserfit can help.